once upon a time, i had a nikon e995 digital camera and a raynox msn-200 macro lens. and they loved each other very much, worked so well together, produced such lovely offspring and made me entirely happy. then the lens went missing. i didn't notice at first, it was small and i often left it in odd places, taking it off the camera and putting it back on depending what shot i wanted. the worry started to grow after a few weeks though and searches were conducted, far and wide, all the way to bendigo, really but still, no lens, no beautiful pictures to take and a very lonely nikon. it's been almost 9 months since the search was officially called off and i'm still fighting the impulse to look under couches and inside boxes that have already been thoroughly checked (and checked). finally, i think i may have come to terms with the loss. my new camera helped console me and last week i finally took a deep breath and ordered a new raynox lens. not quite as small as my old one, not quite as magnifying but also not quite as expensive and easier to adapt to my d70s. it's a whole new macro world with these two new friends, a lot more control and a huge learning curve ahead of me. i can't wait! I hate that feeling! I lost my drivers license and found it 3 months later!..in my handbag. Before going OS one year I hid a small sculpture that means a lot to me. I don't think anyone would take it but I didn't want anyone to trash it if they broke in. I hid it so well, that I couldn't remember where I had put it. I looked everywhere...one and half years later I found it. Now all I have to do is find my husbands spare car keys. (b)use a rotary cutter for cutting the fabric after ironing it. Don't know if you have a rotary cutter, I don't but am going to buy one so feel free to borrow. Good luck, Sara has got me on to reading about your craft, love it. Great photography! 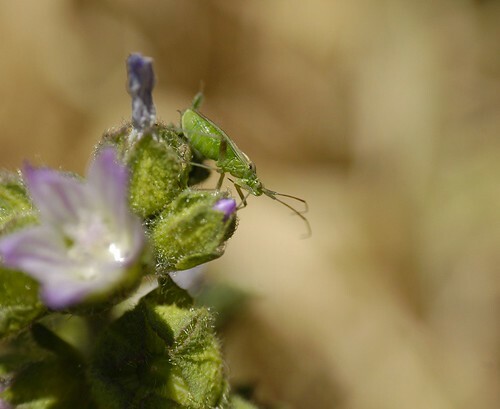 The green bug with flower is really amazing.